Your dental health is important. You only get one set of teeth in your life, and even if there have been improvements in dentures and dental implants, these aren’t things you should be relying on in your old age. Instead, take the time to care for your teeth now, no matter how old you are. A better dental care routine, like this one sanctioned by a Brooklyn NY dentist, is your best bet. Here are some tips to make sure you’re taking care of all of the basics the right way. Just doing these things can help keep your teeth in much better shape for years to come. Everybody knows that brushing is not optional. However, most people really don’t brush as often as they should. 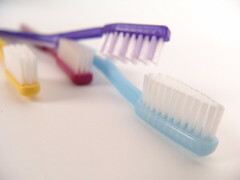 To keep your teeth clean and healthy, you should be brushing after every meal and snack. This might seem like a lot, but for the most part, it’s easy once you get in the habit of brushing after you eat. However, when you eat acidic foods you should wait about 30 minutes before brushing because the acidity can attack your enamel and brushing can actually do some damage. In the meantime, simply rinse with water. A lot of people brush their teeth after they eat, but many people neglect the dental floss entirely. If you ask a dentist, they’ll tell you that only brushing your teeth, even if you do it regularly, is still an incomplete dental routine. Carry dental floss with you and use it after you eat. Obviously you don’t need to do this in a restaurant if you’re going home, but having floss in your car and office can help you keep those pearly whites cavity free. Gum with xylitol helps to clean your teeth, and if you can’t get to floss and a toothbrush right away, it is your best bet, along with rinsing with clean water. Keep sugar free gum with xylitol nearby when you’re on the go. Taking care of your teeth at home is all well and good, but you need to be visiting the dentist regularly if you want a healthy mouth. Make an appointment for a checkup and cleaning every six months. By doing this, your dentist will be able to catch any problems before they become serious and painful. Are there any other tips you'd like to share?